Why Is Everyone Talking About Mobile First Indexing? To put it simply – Google is making every effort to make the web more mobile-friendly. And the mobile-first approach is just one of the continuous recommendations it is implementing. We have created this guide to let you know what mobile-first indexing actually is and how it could affect your business. After all, you don’t want to lose the rankings you have worked so hard for! 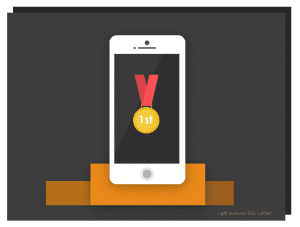 So, what is ‘Mobile-First Indexing’? This approach it very much as it sounds, the idea that the starting point for designing your site should prioritise being mobile-friendly. This is because mobile design is the hardest to achieve, being the smallest screen and having to fit a whole website in a way which looks presentable and still shows the information the visitor will need. By starting with making your site mobile friendly, you will have to only stick to the essential content and features on the site, because bulks of text simply won’t fit and won’t look appealing. You will need to consider the user-friendliness of your mobile site, including limiting content (however hiding keyword rich content on your mobile version can mean you will drop now that mobile is assessed first), and ensuring that buttons are big enough to be pressed by a visitor using any touch-screen mobile device. 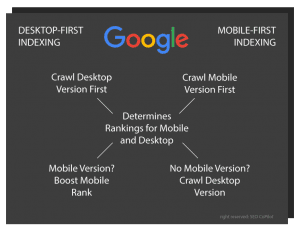 If you opt for the mobile-first indexing approach, you will likely find it much easier to design for desktop and other devices as you will have an expanding canvas to work with. At SEO CoPilot, we strongly recommend taking on this method of website design because, not only does it make it easier to design for other devices, but your rankings could actually drop if you don’t follow the guidelines for making your site more user-friendly across a number of devices. You should consider redesigning your mobile version, taking into account this update and including the features which are recommended by Google. 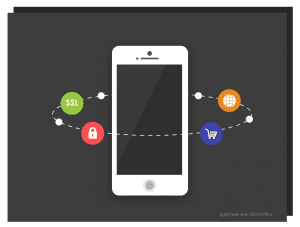 We’ve established that it is important to make your site mobile friendly, but where do we start? Firstly, although it is important to listen to Google’s notification – there’s no need to panic. The first announcement from Google regarding mobile-first indexing came in November 2016, however there has been continuous testing since and we are only seeing gradual impacts on rankings. So you do need to consider mobile-fist indexing if you want to remain/ get to the top positions of Google, however you still have time. 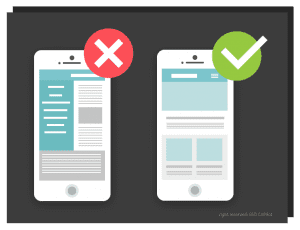 But remember, if you are planning on giving your site a redesign to ensure that it follows the mobile-first index guidelines, this will take time, so you should consider starting the process sooner rather than later (just to be on the safe side!). Responsive design – it may seem obvious, but it is easy to create a great looking site which doesn’t work on mobile. It is important that you create a design which changes depending on the screen size. Remember – not all mobiles are the same. Responsive design alone will not be enough to comply with Google’s latest update, but if your site is already responsive you are in a better position than others. Just remember to make the other changes to avoid losing your rankings. Content – you won’t be able to fit paragraph after paragraph of information on a mobile site, so make sure you only keep the information which is going to be the most beneficial to your users, and will help you rank for your chosen keywords. Site speed – have you ever tried loading a site on your mobile and waited so long you just close it off? This is what you need to avoid, and the best way to do this for most sites is from a re-design. Google’s new update includes the “Speed Update” which will only affect pages with the slowest experience to users. User-friendly design – where many people go wrong is that they create an amazing looking design but fail to consider how their visitors will actually use the site. The human mind craves cognitive equilibrium — being able to put pieces logically together, finding things where they’re expected, and locating what they are seeking. Thus, a strong and logical site structure is cognitively satisfying to users. Google especially, sees user experience as a very important factor in today’s Algorithm. If you’re worried about losing your rankings by not following Google’s mobile-first indexing announcement, but feel like you’ve been thrown in the deep end, you may need a professional to help you. With knowledge of both website design and SEO, we are confident that we can design a site for you which is mobile friendly and prevents you from losing your rankings. Get in contact with SEO CoPilot today on 01246 556 565 for more information on the update and what it means for your business, or to get started on creating a mobile-friendly site that you (and Google) will love.